By playing at Ice Lotto today you will get 1 free ticket in the next USA MegaMillions draw where you can win millions of dollars in cash prizes. Plus buy 1 get 1 free on your first purchase! IceLotto.com is a fully licensed and legitimate online lottery provider. 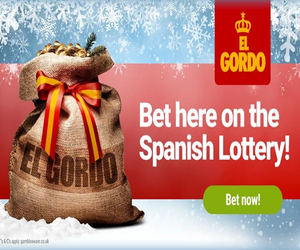 They have become one of the biggest lotto sites in the world, giving their players access to major official lotteries from numerous countries. They are well known as a one stop lotto shop. Some of the tickets that you can play at Ice Lotto include the USA Powerball, MegaMillions or NewYorkLotto, Spain’s La Primitiva, El Gordo or BonoLoto, Europe’s EuroMillions or EuroJackpot, Canada’s Lotto649, Italy’s SuperEnalotto and the UK National Lottery. Opening / Special Offer: By opening an account and purchasing any amount of tickets you will get one free group ticket into the next USA MegaMillions draw. (purchase necessary) The USA MegaMillions draw has some of the biggest jackpots in the world, the biggest of which was over $326 Million! As well as getting a free ticket you will also get a buy one get one free on your first purchase. Simply buy your first ticket and you will get 100% bonus money in your account which can be used on your second purchase. Meaning that you double your chances of winning lots of cash. Buying Tickets: When you buy tickets you can purchase a single entry ticket, multiple draws or a subscription. If you choose to play in multiple draws or on a subscription you will get a discount depending on the particular lottery and how long you want to play. In order to dramatically increase your chance of winning you can buy a group (syndicated) ticket. There are up to 150 other members in each draw playing with as many as 50 lines. If you choose to play a group ticket with a bonus number then each possible combination will be chosen meaning you are guaranteed a prize. Any tickets that you purchase will be scanned in so you can see the actual ticket in your personal account area. Bronze members will get 3% discount on all purchases, Silver members will get 3% bonus money and 5% discount, gold members will get 5% bonus and 10% discount and platinum members will get 10% bonus money and 12% discount. You are automatically entered into the VIP club as soon as you have 400 points in your account. Deposits: IceLotto accept all major credit / debit cards. You can also deposit into your account using Skrill, Ideal or by bank transfer. Claiming Winnings: If you win less than £5 it will be added to your account balance to buy tickets for future draws. Once you have over £5 you can cash out using debit / credit card or Skrill. If your balance is over £50 you can withdraw directly to your bank account. really great company,always scanned my tickets on time, I won yesterday a really nice amount, I”m going to buy my dreams car.